Kimberly Purpoz was interviewed on the Black Authors Network Radio, hosted by Ella Curry. This month, Kimberly Purpoz also attended the Black Pearl Magazine's Atlanta Chocolate Affair. This month Age of Innocence was featured in Love Romance Novels Revolving Books. Copies of Age of Innocence were given away to bookclub presidents and attendees at the Black Pearl Magazine's Atlanta Chocolate Affair. In July, Age of Innocence book trailer was also featured on RawSistaz.com. Foreshadowers: The Book of Legends (Book 2) will be released by Messenger Books in August 2011. Check back for further updates. Get your Free Sample downloads of all my novels from Smashwords.com! You can get 25% off with this announcment for my novel Age of Innocence on Smashwords.com, just enter the following code: TE22K. Offer expires on August 17, 2011. ***Foreshadowers: The Book of Legends (Book 2) is coming soon! Check Purpoz’s blog page for updates. When Safina Whitewolf goes away to college, she discovers that she has a sister name Joanna. Safina also learns that she is a Foreshadower and is destined to save the universe. Safina was attacked, by evil shadow stalkers sent by Dark Landor’s Army. Her identity was compromised and the Dark Army is hot on her trail. The Light Army sends a gorgeous shape shifter, Troy Knight, to save her. Mesmerized by Troy’s heroic charm Safina falls in love. Will Safina and Troy find the Book of Legends before it gets into the hands of evil? Join the mystical tale of the foreshadowers, as you enter their realms of adventure. It is the middle of Summer. Why not enjoy you vacation with a good book? Often time when you don't pursue your dreams and aspirations, it is because you believe that it is beyond your reach. These dreams are often times based on your talent. My talent is writing. I decided to go out there and to make it happen. Sitting dormant is not going to make your dreams a reality. Sometimes you just have to get up and take charge of your life. When you base your life on your divine purpose, you can’t go wrong. Dare to dream and live your life on purpose! So get up! What are you waiting for? Get your Free Sample downloads of my novels from Smashwords.com! You can get 26% off on Smashwords.com for my novel, Age of Innocence, just enter the following code: Age of Innocence - SSW25 and Offer expires on July 31, 2011. Here is the new cover for my new novella Foreshadowers: The Book of Legends. 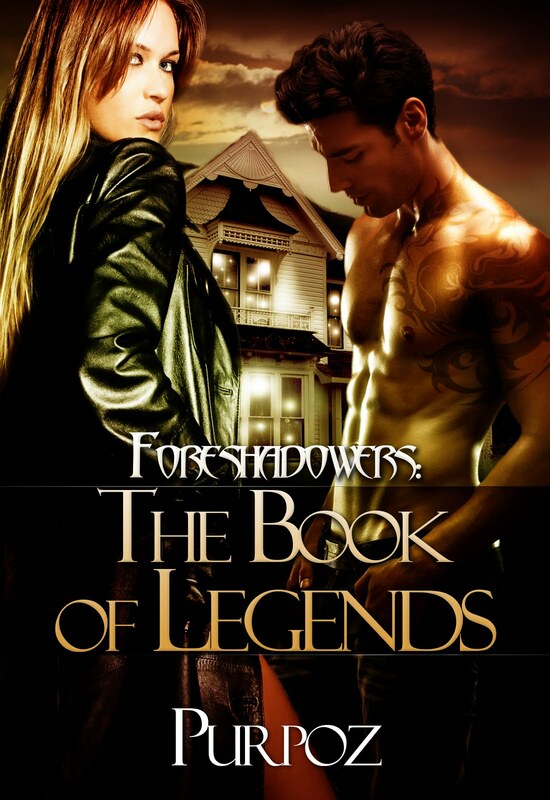 Foreshadowers: The Book of Legends is the second book in the Foreshadowers book series. I want to thank my graphic designer, Tuesday, for doing an awesome job on all of my book covers! I really do appreciate it. This month Age of Innocence will be featured at the Atlanta Chocolate Affair and the book trailer will be featured on Rawsistaz.com. Purpoz gave proceeds from her booksales on Kindle.com and Smashwords.com. This summer she gave proceeds to a non-profit charity, Georgia Campaign forAdolescentPregnancy Prevention (G-CAPP). This summer Kimberly Purpoz was a gold sponsor for the Midwest Book Fest in Wisconsin.